First of all the service was fantastic! The staff was pleasant, polite, attentive and very friendly. I sometimes thought that they could read my mind, because when I needed them - they always were close to me. The second thing - the view from my room was stunning! I even forgot that it was Odessa when I looked at the beautiful sea from my balcony and feel the fresh breeze in my chest. I also want to mention about the meal. It was delicious. Really. The breakfast was satisfying the same as other meal during the day. The whole team of La Gioconda Boutique Hotel is so thankful for this wonderful review regarding your experience with us! We are absolutely delighted to hear that you had such a pleasant stay. We love that you enjoyed our comfortable room facilities with such a marvellous sea view, our delicious breakfast and the work of our friendly staff who strives to make our guests' experiences memorable. I will definitely share all your compliments with our team, and once again, we are so happy to know that you had such a great time. We are always looking forward to welcome you again to La Gioconda Boutique Hotel whenever your travels bring you back to Odessa. Wonderful quiet place by the sea, view to die for . Excellent attentive service, delicious authentic food, manicured landscaping, away from the city noise and still steps away from the Center of Odessa. Thank you so much for such an amazing review! It is so pleasant for the whole team of La Gioconda to know how highly you valued your experience with us and that you enjoyed the stay in your comfortable room with an impressive sea view. We feel so inspired to know that you would love to visit us again, which means that we managed to meet your expectations and your stay was truly memorable and enjoyable, and that is what we are striving for! Once again, thank you for sharing your impressions with us, and we are looking forward to welcoming you back at La Gioconda Boutique Hotel! La Gioconda is set way back from the main street. The narrow road that takes you there twists and turns through a quiet neighborhood. The pool area is small but it is off-season and I did not come for the pool. There are plenty of areas to lounge and enjoy the open air. The rest of the well-maintained grounds are dedicated to flowers, trees, shrubs, and low hedges that altogether form a breath-taking garden. So serene. You can hear the birds chirp and watch the honey bees flutter over roses and lavenders. On its own, the landscaped lawn is a sight to behold. Postcard-perfect and up-lifting. 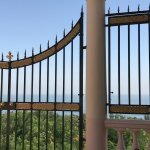 But the lovely garden is just an opening act for what lies beyond: the grandeur of the Black Sea beautifully framed by the wrought iron gates. I found myself the sole guest at breakfast on Wednesday, much to my delight. I had the whole Italian villa at my disposal—and to think that I only paid for the room. There was no buffet, of course—that would have been excessive. Luxury does not have to be wasteful. Valeriy, white-gloved and earnest, brought over small plates of sliced fresh tomatoes and peppers, cheese, and cold cuts for starters. What came next was prepared according to my preferences. The 3-egg omelette with tomato, cheese, and bacon was the fluffiest I ever had. The porridge was creamy with a sprinkling of diced fruits. It was everything I envisioned my ideal breakfast to be, now realized and served in a dreamy setting. I lingered in the exquisite room admiring the crystal chandeliers, the painted upper walls, and other interesting objet d’art; sipping my tea and taking in the view of the Black sea. Fully immersed in the beauty that surrounded me inside and outside—art and nature; no cares, no concept of time, except the light of day that brought such physical splendor to life. If the soul exists, it would now be in nirvana. The beach is a 5-minute walk down a series of stairs and landings. You will come across a gravel trail (just above the tennis courts) and an asphalt roadway (good for biking or running). Bellow you will pass by the restaurant, Villa Otrada, right before the beach. (I mentioned the name only because it is a good marker.) The trip back up the same route takes as long as it takes, depending on your fitness level. You will break a sweat no matter how fit you are, unless it is freezing outside. That will be your cardio for the day. On Thursday, the other guests finally found their way to the hotel in time for the breakfast buffet. I could hear the faint clinking of china and silver and the tap-tap of Alexander’s shoes as I made my way up the stairs from room #1 (yeah, the one with its own sauna). It was a gorgeous morning and the guests opted for al-fresco dining—smoker and non-smoker alike. Later that night, a couple enjoyed an intimate dinner in the restaurant to the accompaniment of their very own saxophone player. Life’s little pleasures. Arina gladly accommodated my request and showed me some rooms. The Deluxe rooms are gorgeous and well-appointed with ample balconies. The Classic room with a different motif has only a Juliet balcony that faces the back so not much to see there. Each has a bidet: a feature I could have used more than a sauna. Definitely would like to stay in a Deluxe room next time. All rooms are tastefully furnished the materials used are of superb quality. I have to thank all the staff (Anna, Arina, Alexander, Valeriy, and the ones whose names I did not get) for top-notch and personalized service. Their sincerity, enthusiasm, and hospitality made my stay special and unforgettable. Our staff take great interest in our guests to ensure that they feel comfortable and at home and Your kind words encourage us to keep working everyday to better our service! On behalf of myself and all the staff, we would like to thank you, and look forward to welcoming you back to La Gioconda Boutique hotel again soon. I have to apologise - this review is about hotel restaurant ( which is often overlooked ), rather than hotel itself. I had a business lunch there and was very impressed by quality of food and service. Staff was very friendly and attending , the food was perfect - I would challenge you to find a better "borsch" anywhere in Odessa - and setting was beautiful with a sea view to die for. It is a bit out of the way, but well worth the visit if you are looking for a quiet place and perfect meal. Omg- what a beautiful place! Room was wonderful and hotel grounds were just stunning which made for both a good and bad part of the stay. 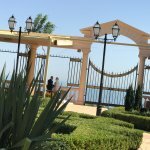 It seems many couples use the hotel grounds for wedding photos- and they take HOURS of wedding photos in Odessa. One day there were 2 different drones. While the hours of photography were only mildly intrusive to my relaxing by the beautiful little pool, the droning of the drones was extremely annoying. The beach is 5 minutes away- but straight down (which was fine) and straight up to return (which wasn't). The staff was excellent and really went out of their way. On the one hand I find this much attention overbearing but I do appreciate that this is what they are supposed to do. There was a little glitch over the check one evening but the staff was so mortified that I felt I should apologize to them and they more than made up for it. Buffet breakfast was definitely the loveliest I've seen in the past month of traveling in the Baltics. Finally- many thanks to the receptionist (I think her name was Anna or Irna- she will know who she is) who made my bus reservation to Chisinau. The website would not take my American credit card. She called her father to have him put money on her card so that she could pay and I paid her. I hope this does not embarrass her. I tell the story because it was service above and beyond the call of duty and hotel service just doesn't get any better! Thank you for taking the time to share your feedback about your La Gioconda Boutique Hotel experience. Your fantastic comments commending the staff, breakfast, place and service is greatly appreciated and we are delighted to hear that you enjoyed your stay. On behalf of myself and all the staff, we would like to thank you, and look forward to welcoming you back to our hotel in the very near future. Everything was on top level. the room was good, great view, the staff was extremely friendly and helpful , on step was too much for them. the breakfast was really good and also the other food was goo and available all day! A place to go back. 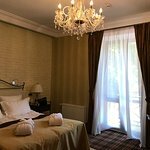 I would like to thank you for choosing La Gioconda Boutique Hotel during your stay in Odessa and thank you most sincerely for yours highly positive feedback on La Gioconda Boutique Hotel on www.tripadvisor.com Your kind words encourage us to keep working everyday to better our service! Once again thank you for your glowing review.